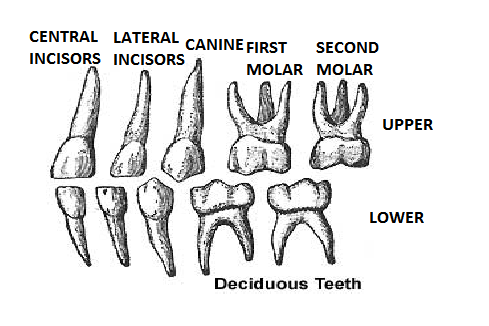 The completed tooth structure is shown in the diagram on the left. 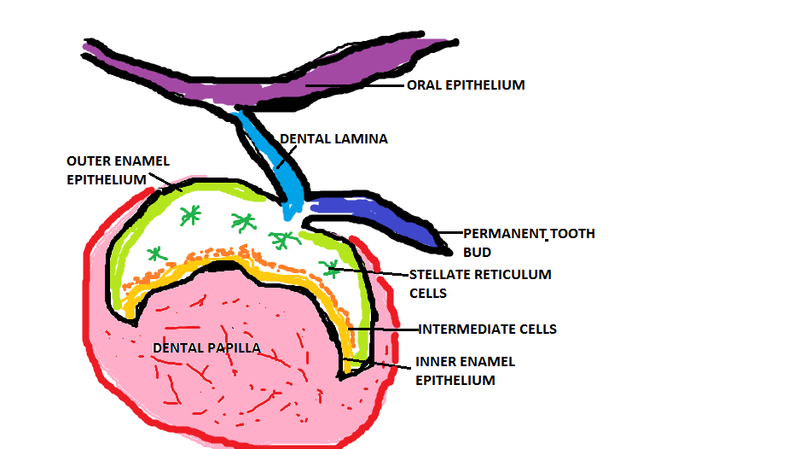 As you can see above the tooth starts growing from little cell structures, but eventually forms a tooth shape and different layers of structures. The outermost layer is the tooth enamel. 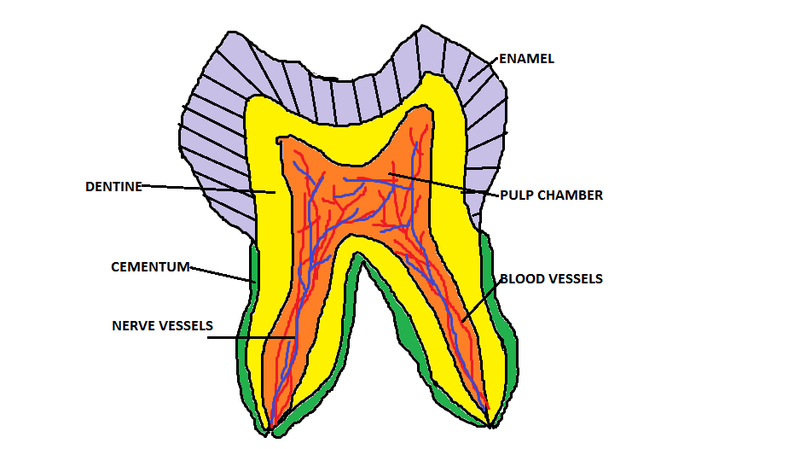 The tooth enamel is a hard crystallized structure usually opaque or translucent. It is the outer most shell of the growing tooth, only a diamond coated instrument can cut through it. So you might ask, if its so strong why do we get decay ? the reason being is that when the growing tooth is decayed the mineral structure is lost , therefore the strength of the enamel crystals are compromised leading to the collapse of the structure and invasion of bacteria into the tooth. The second outer most is the dentine layer, this layer contains many dentinal tubules which in it has dentinal fluid, the change in pressure of the fluid can cause us to feel the pain sensation. This sensation is commonly known as sensitivity. The innermost layer is the pulp chamber which contains the blood vessels and nerve vessels. Usually if very severe throbbing pain is felt, it means that the pulp chamber has been compromised and the removal of the pulp through root canal therapy is indicated. When babies start to grow teeth , the process is called teething babies. As seen from the chart, the baby’s first tooth begin to break through the gums at about 6 months of age. Usually, the first two baby teeth to erupt are the two bottom central incisors (the two bottom front teeth). Next, the top four front baby teeth emerge. After that, other baby teeth slowly begin to fill in, usually in pairs – one each side of the upper or lower jaw – until all 20 baby teeth (10 in the upper jaw and 10 in the lower jaw) have come in by the time the child is 2 ½ to 3 years old. The complete set of baby teeth is in the mouth from the age of 2 ½ to 3 years of age to 6 to 7 years of age. A general rule of thumb is that for every 6 months of life, approximately 4 baby teeth will erupt. Shortly after age 4, the jaw and facial bones of the child begin to grow, creating spaces between the baby teeth. This is a perfectly natural growth process that provides the necessary space for the larger permanent teeth to emerge. Between the ages of 6 and 12, a mixture of both baby teeth and permanent teeth reside in the mouth. Baby teeth are as important as permanent teeth. Most people will say that, why should they care for baby teeth when eventually they are all going to fall out anyway. This is where most peoplae are mistaken, baby teeth actually help keep the space vacant for the permanent teeth, without it the permanent teeth will not know where to erupt in the mouth. Therefore, brushing baby teeth must be done. If the baby is still very young, use a wet towel as a substitute for a toothbrush.